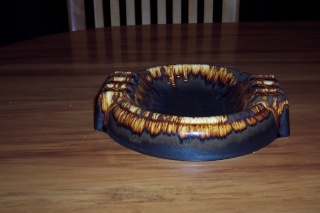 Mucking around with Crown Lynn ashtrays atm and the one above posted by HeatherT 'A 70's Classic Big One' jumped out at me because of the glaze !!! 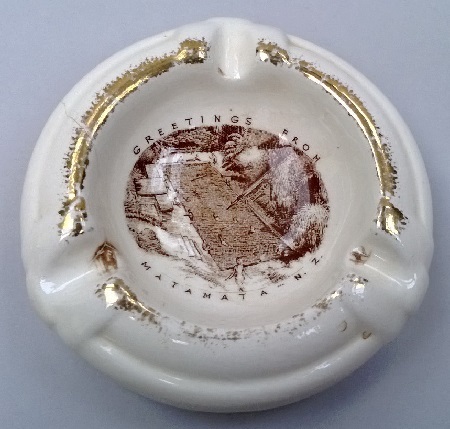 Heather T's Riveria ashtray could this be the 3615 ? 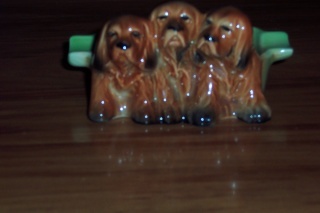 In the Deco advice book it reads - Riviera, speckle and fantasy 3615 ashtray. Although... 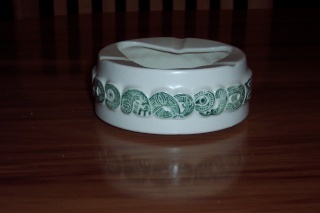 I have a white ashtray - with MADE IN NEW ZEALAND on the base - 3 clips but spaced equally around the rim. The base is indented. So not conclusive but a start? Ev more searching into ashtrays... came up with more references to the 3615 shape ashtray. 1038 and 1045 both you have identified. 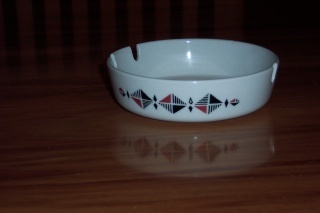 Lastly - Ashtray 4611 shape - which takes you a roll edge flatware shape. 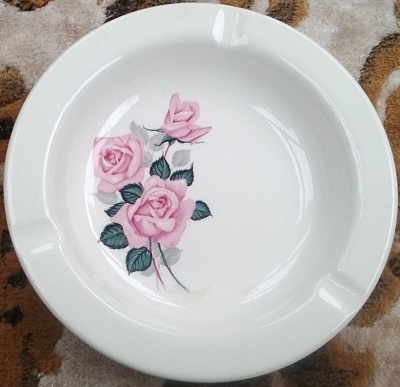 Looking at the Fashion rose ashtray, this could be a possibility. Hmmm it's earthenware not vitrified and I have a list of 45 ashtrays of which 12 we have identified. 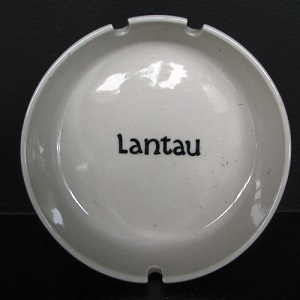 Only 6 are vitrified and I'm leaning towards the 860 Earthenware Small Ashtray, because it's an earlier backstamp in lustre. 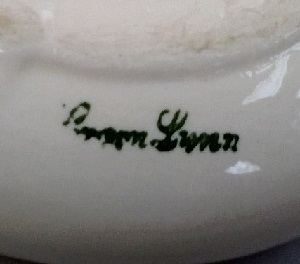 Haven't got around to taking a photo of the backstamp! Those ashtrays with the cars on them are early too. 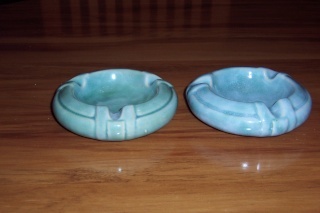 I found an auction on Google for the set of 6 racing car ashtrays which are the same shape as the Fashion Rose listed by unouwanit and she mentions the gold gilt on them. 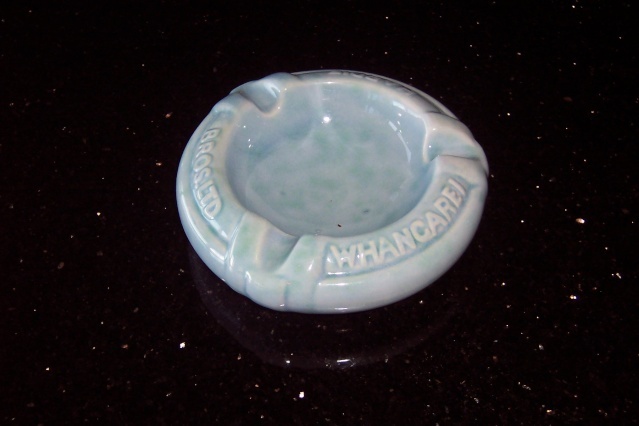 It's definitely vitrified as will be the Riviera one and there are not that many vitrified ashtrays so this should be easy to work out. 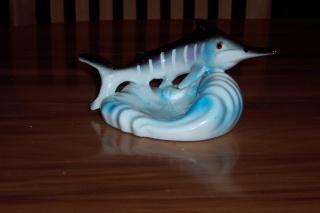 1071 - as per the Portage Site - who has one of these beauties? yes Ev.. 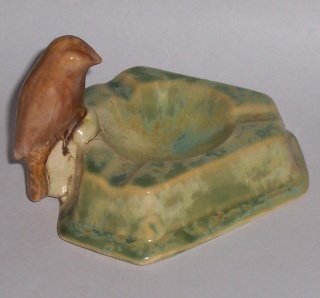 This would be the sandown shape that you posted to me last week..
We still don't have the shape 163 Ashtray in the Gallery and this shape is old and usually has the old Specials Department glazes on them, so my feeling is that this is the right shape. There are no other shapes in this era are there? So there are hot pools at Matamata I gather .... ? I'm going to put this into the Shapes Gallery as shape 163 everyone. To qualify my reasoning I want to add that Val's ashtray doesn't have fraction marks like this shape and because of that it fits well into the early shapes.